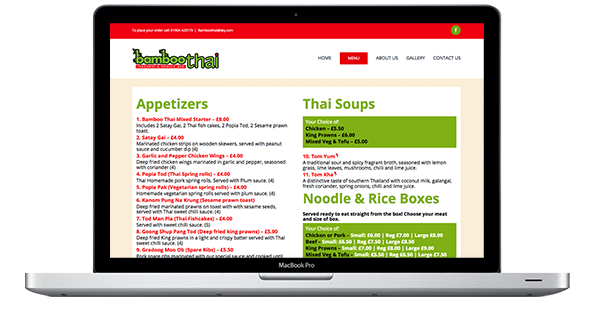 York Thai Takeaway and Noodle Bar offering authentic Thai food to eat in or take away. 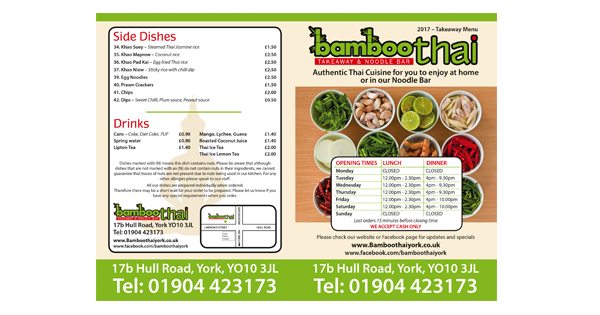 Welcome to Bamboo Thai, a family run Thai takeaway and noodle bar established in 2015 which already has a large number of loyal, regular customers who enjoy the friendly service and excellent quality food produced by our Thai chefs. Bamboo Thai offers authentic Thai cuisine prepared from fresh ingredients for you to enjoy at home or in our Noodle Bar. A wide range of tasty Thai dishes; Appetizers, soups, curries, noodle and rice boxes, stir fried, Thai salads and some kid’s dishes. Most dishes are offered with a choice of meats, king prawn or a vegetarian option. Some only lightly spiced with others more so!!! Soft drinks to accompany your meal are also available. See our menu for the full range and more details of the ingredients in each of our dishes. Don’t Just Take Our Word for how good we are. Here are some comments from our customers! Best Thai in york, everything I have ever had from there has been amazing!! Especially the chicken Penang!! Bamboo Thai is amaaaaazing!!!!! Beautiful tasty food, brilliant prices, super friendly staff! Thank you Bamboo Thai! Never dissapointed! Tried Bamboo Thai for the first time tonight and it can be summed up in one word….Outstanding!! Compliments to the chef/owners. I love this place so much! It’s my favourite Thai in York (and beyond). Nothing is too much trouble and they are all lovely and welcoming. The food is 10/10.